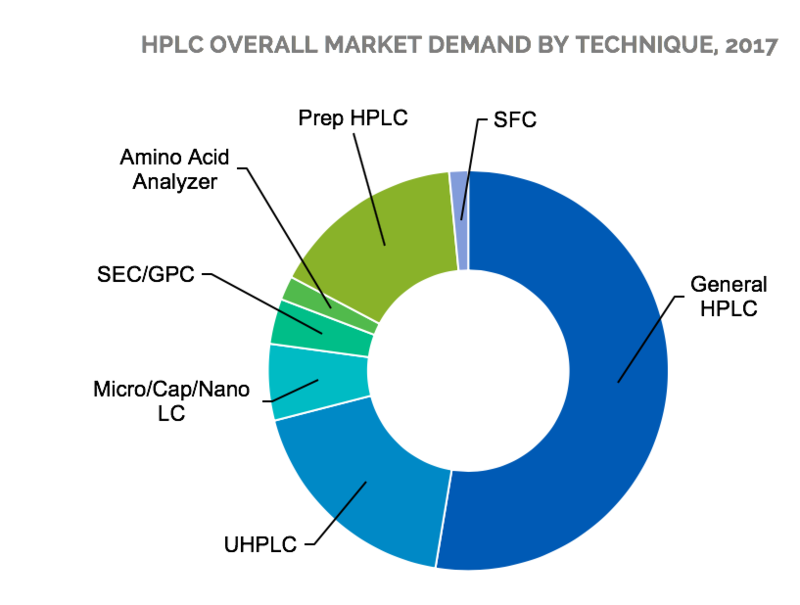 In the first two articles of this series we covered the recent industry events within the HPLC market and gave a technical overview of 10 of its sub-technologies. This article will take a sneak peek into our 2018 HPLC Market Analysis and Perspectives report and give some insight into the future of this $5+ billion-dollar industry, which, despite its movement towards a saturated market, shows several opportunities for expansion. Our findings show that the global market is predicted to grow at a rate of 4.6% per year over the next five years. Regionally, US & Canada and Europe dominate the market share and will be bolstered by strong R&D funds in the pharma/bio sector and increasing academic research budgets. China is projected to have the largest growth in the next five years driven by multiple government and foreign investments in biopharmaceuticals and growing demand for environmental and food testing. As we mentioned in the initial post of this series, the pharma sector, which occupies almost a quarter (23%) of the market demand, continues to contribute greatly to the growth of the overall HPLC market. 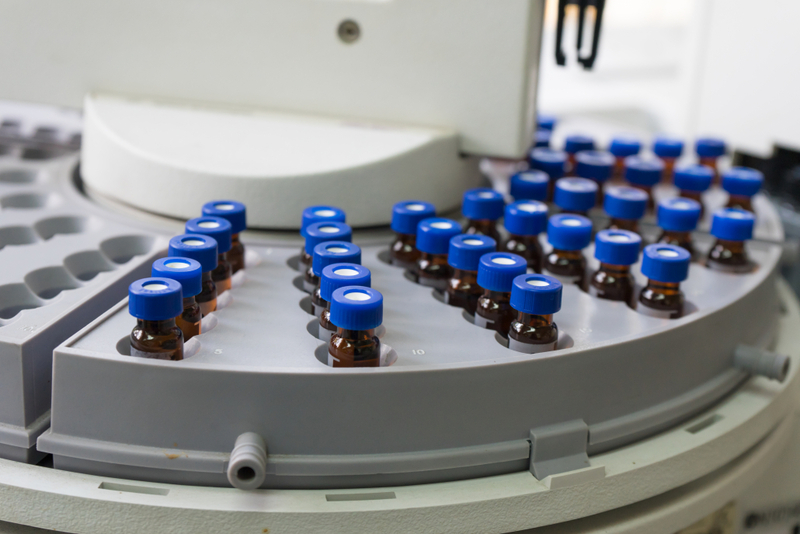 Though general analytical HPLC has been the dominant technique, UHPLC will have the highest growth rate as technological advancements expand its application across many industries, especially in pharmaceuticals. The pharma/bio sector will contribute greatly to the supercritical fluid chromatography (SFC) market, though it currently occupies the smallest market share. Prep HPLC has also been adopted by the pharma/bio sector as a preparation method for further analysis in drug production and discovery. Interestingly, the demand for cannabinoids content analysis to ensure product quality will eventually open a new opportunity for HPLC, despite increasing market saturation. In fact, since the spread of legalized recreational cannabis in the US, there has been an influx of activity leading to stringent statutory and regulatory requirements. Increased volumes that need to meet these requirements has raised demand for efficiency in testing instruments. While medicinal cannabis has undergone much testing for many years, the scope has now expanded to include additional checks for cannabinoid potency levels and terpene profiles. Demand for improved food testing and standardization has spurred growth for many instrument markets including HPLC. Instruments have now been enhanced to allow efficient testing of pesticides, heavy metals, residual solvents, and mycotoxins (IBO 7/31/18). So, it’s reasonable that our studies indicate that those in the general, food, and environmental testing were mostly likely to need and purchase new systems. These trends correlate well with the various functions that HPLC techniques serves. Basic research applications are mainly found in academia which holds the second largest share in the HPLC market. It is important to note that government funding is directly related to HPLC demand in this field. Analytical service functions, which make up almost a third of the HPLC demand, are commonly found in CROs, the agricultural/food industry, and general/environmental testing, again reflecting the market’s growth in response to increased regulations. However, CROs are also seeing increased demand from pharmaceutical and biotech companies, especially in developing countries. 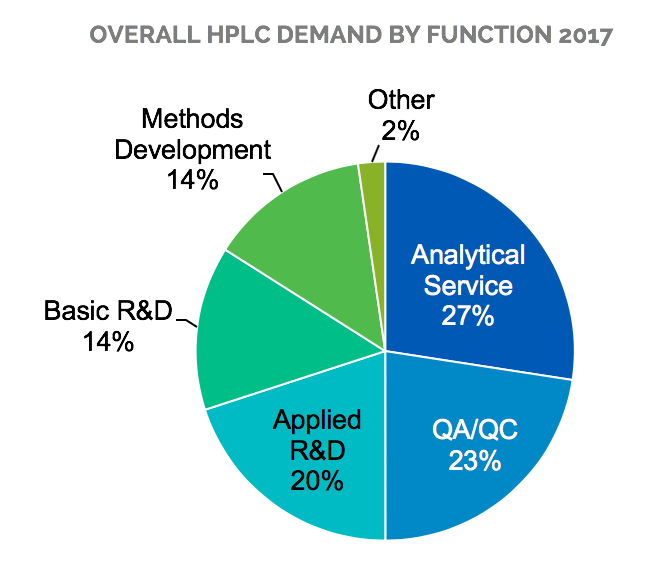 It was mentioned earlier that certain techniques within the HPLC market are saturated or moving towards saturation — however, for these techniques there is room for growth and revenue in the aftermarket. The aftermarket encompasses columns, chemicals, and components such as accessories, software, and any other supplies sold after the original order. Our report covers over 10 different technology sections including UHPLC, Supercritical Fluid Chromatography, and Micro/Cap/Nano LC amongst others and discusses which are most likely to experience higher sales in the aftermarket due to saturation. Our market analysis and perspectives provide not only a 5-year forecast detailed by segments, but also a section covering end-user perspectives.